Next year brings the hundredth anniversary of Edgar Rice Burroughs’s first two published novels: A Princess of Mars and Tarzan of the Apes, as well as a big-budget film version of A Princess of Mars from Disney. (The film is saddled with the unfortunately bland title of John Carter. Fear of a Red Planet?) The effect these novels had on popular cultural was immense: they created a whole medium, they altered the nature of reading for pleasure. Pulp magazines existed before Edgar Rice Burroughs had the idea he could write better than the tripe found in the publications where he was working to place ads; but it was the success of first Under the Moons of Mars (the serial title for A Princess of Mars) and then Tarzan of the Apes in 1912 that made the pulps into the artillery of the Reader Revolution. The pulps turned the U.S. into a nation of readers, and ERB fired the first two shots in the revolution. Then, twenty years into the revolution, he fired off the few rounds of his “Venus” series. I have planned some festivities for the upcoming centenary of the Burroughs Upheaval. One is an ambitious project I have wanted to try on Black Gate for the last two years. But as a prologue to my 2012 ERB projects here in 2011, I’ve chosen to present a look at Burroughs’s least popular series, the last one he started before his death. These posts will have a different structure from my usual free-form analysis style. Inspired by columns I’ve seen on the movie review sites I frequent (particularly “Franchise Me” on CHUD.com), I’ve laid out a template for tackling each of the five installments of the Edgar Rice Burroughs “Venus Saga.” An experiment? Or an admission that trying to go academic on this series feels like the wrong approach? I’m not sure myself, but here it goes…. Our Saga: The adventures of one Mr. Carson Napier, former stuntman and amateur rocketeer, who tries to get to Mars and ends up on Venus, a.k.a. Amtor, instead. There he discovers a lush jungle planet of bizarre creatures and humanoids who have uncovered the secret of longevity. The planet is caught in a battle between the country of Vepaja and the tyrannical Thorists. Carson finds time during his adventuring to fall for Duare, forbidden daughter of a Vepajan king. Carson’s story covers three novels, a volume of connected novelettes, and an orphaned novella. The year is 1932, and Edgar Rice Burroughs is not only a man, he is a corporation. The enormously popular author of the Tarzan novels has become the first writer to incorporate himself. And so far, ERB Inc. is doing exceptionally well, with its third successful book release, Tarzan Triumphant, landing in the bookstores, and a rash of lucrative subsidiary products such as the hit movie Tarzan the Ape Man (the first Johnny Weissmuller Tarzan film), a Tarzan radio series, and a Tarzan Sunday comic strip. And yet, Burroughs, nearing his sixties, wants to show that he can stretch a bit. The Tarzan series is still selling, but it has fallen into one of its most tired phases; the glory days of Tarzan and the Ant Men are gone. The Martian series and the Pellucidar series are both sputtering. What to do? Why not start another series to get back to the early enthusiasm that made all those earlier series so great? Other authors, such as Otis Adelbert Kline, have turned their sights on Venus, so that might be the place to go. 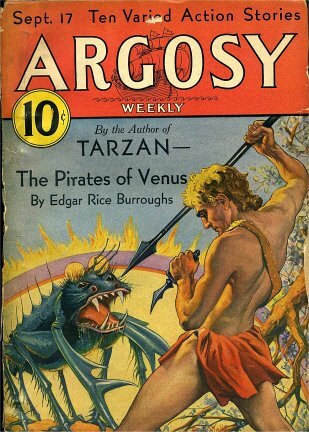 Burroughs ignited the “The Carson Napier of Venus” saga: Pirates of Venus (1932), Lost on Venus (1933), Carson of Venus (1938), Escape on Venus (1946), plus the novella “Wizard of Venus” (finished 1941, published 1964). Although not published consecutively except for the first two (which followed one another closely in serialization in Argosy), the four books form a continuous story from the point of view of Earth hero Carson Napier. How does the last series of the Great Progenitor, the Carrier of the Mystical Three Initials, hold up compared to the rest of his gallery? As is the standard for most of Edgar Rice Burroughs’ “scientific romances,” the story begins with a fictional version of the author relating how he came across the remarkable story you are about to read. Pseudo-ERB receives a visit from Carson Napier, a relative of the famed John Carter, a former Hollywood stuntman, natural telepath, and now a rocket designer with the intention of visiting Mars. Later, he uses his telepathy to send his incredible story to Mr. Burroughs. Carson didn’t quite get to Mars. He and his scientists failed to account for the gravity effect of the Moon when they launched the rocket. Carson’s decision to simply aim for Mars on the horizon, instead of accounting for its movement as well, didn’t help. Carson’s misguided rocket puts him on a course straight into the Sun. But incredible luck (“the all-time cosmic record for poor shots”) brings him into Venus’s gravitational pull, and he pilots into the clouds and parachutes from his ship into the thickly vegetated planet below. Carson finds himself in the country of Vepaja, populated by an arboreal human culture that call their planet “Amtor.” The Vepajans are all beautiful and have attained near-immortality with a longevity serum, which they freely give to Carson. Because of fears of overpopulation, they practice strict control of reproduction among their people. Vepaja was once a vast country, but now only one island remains. The rebellion of a group called the Thorists, who attacked the cultured class and set up a cruel oligarchy while promising full equality, has taken over the rest of old Vepaja. After a series of mishaps in the jungle, Carson and the Vepajan man Kamlot fall into the clutches of klangan (sing. “angan”), the birdmen of Amtor, who take them to the Sofal a prison ship from Thora. Carson readies the crew for a mutiny, and once taking control of the ship he rescues Duare, the daughter of a jong (King) of Vepaja. Carson is madly in love with Duare, but she’s forbidden to him. Further ocean action ensues before the story comes to an abrupt cliffhanger ending. Phillip R. Burger, in his Afterword to the Bison Frontiers of Imagination Commemorative Edition of Pirates of Venus, suggests that Carson Napier may be Burroughs’s attempt to create a more modern, fallible hero. That’s a stretch — I think Burroughs’s rambling plot is what drives Carson into looking incompetent — but the character does have the appeal of seeming more human than ERB’s other heroes. Carson can swashbuckle, but he’s never going to conquer a world or make himself “Lord of” anything. And I agree with Burger that this is a nice change of pace. If Carson’s fallibility worked in tandem with some ambition, Burroughs might have had something here. I love the planet Venus, both its post-Mariner 1 scientific reality of a hothouse of atmospheric and geo(veno)logic mystery, and the early science-fiction vision of a biological wonderland of swamp and oceanic dangers. For ERB to change from the desert adventures of Mars to the moist jungles of Venus makes the enterprise worth reading — at least for me. Your Venusian/Amtorian mileage may vary. Burroughs delves into the world-building of Amtor with his usual zeal, describing a culture that has no sense of the sky, stars, sun, or moon. The language details are especially well developed; ERB had a knack for faux-linguistics in his imaginary worlds. By 1932, other science-fiction writers were doing a better job at creating believable alien worlds (Stanley G. Weinbaum was about to blow apart that whole corner of SF), but Burroughs was one of the originators and he still knew how to cook up the anthropology for places of the fantastic. The early chapters centered on Carson trying to get to Mars and then fumbling to find a way to keep his off-course rocket from roasting in the Sun have the same kind of dangerous fun that appears in the early chapters of At the Earth’s Core. A long time has passed since Burroughs got to do an inaugural journey story, and it feels good to have him back in the exploratory mood. The premise of missing-Mars-but-hitting-Venus is ludicrous, but this is a quaint retro-reminder of the days of space travel in the manner of Jules Verne and H. G. Wells, when it all came down to fuzzy science, plucky individualism, slide rules, and dumb luck. 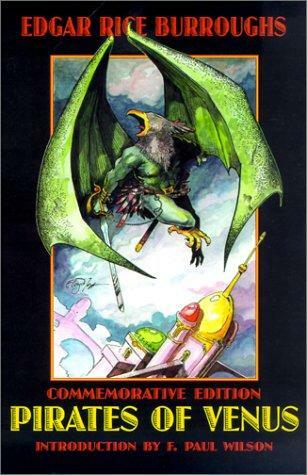 The prologue with the pseudo-ERB is one of the most interesting of these fictionalized looks at the author’s real world. Burroughs was going through a difficult time during the writing of Pirates of Venus, and some of that comes through in his idealized version of his office life. 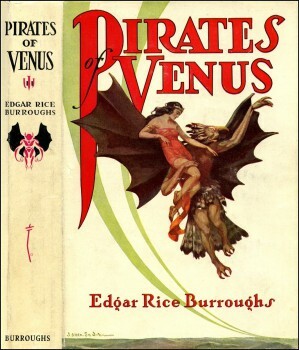 Of all the “Origin Novels” from Edgar Rice Burroughs’s various series, Pirates of Venus is the weakest, and by a significant margin. Stacked against A Princess of Mars, Tarzan of the Apes, and At the Earth’s Core, all of which were written pre-1920, this is some tepid, weary storytelling going on here on Amtor. The prose is about the same — ERB reached a plateau with his style early on — and the level of imagination invested in the setting is laudable, but the enthusiasm for telling a ripping yarn must have flown into the Sun when Carson changed course. Even ERB’s generic plot devices/crutches are absent, and not a single supporting character is the least bit memorable. I just finished re-reading it and I can barely connect anybody’s name with his title or role in the story. The world is fascinating, but the story is a flop — as much as there is a story at all. Pirates of Venus suffers from the set-up slow-down that also pesters the opening of A Princess of Mars, but it doesn’t have the bombastic energy of that book’s second half to offset the problem. The real adventures on Venus don’t begin until Chapter Six, when Carson and Kamlot go on a simple tarel-gathering expedition and end up lost because neither of them is very good at his job. Not until Carson ends up on the ship the Sofal, past the mid-point of the book, does he get much motivation to do anything at all. And even then, it’s soft. Not much happens in Pirates of Venus. Events occur, but not in the sense of an ongoing story. Burroughs doesn’t even trot out his old standby of capture-escape-kidnap-pursuit until the last chapters. Most of the time, pure accident whips Carson Napier around, and he never shows much enthusiasm for any goal. He doesn’t appear eager to find a way off of Venus. He shows no ambition to destroy the Thorists and liberate Vepaja. He has some vague notion about exploration of the equatorial regions, but not toward any end. He either does what seems the most immediately necessary (seize control of a slave ship) or else lets chance do the work (get swept overboard in a storm). Carson’s only real motivation in the novel is his infatuation with Duare. 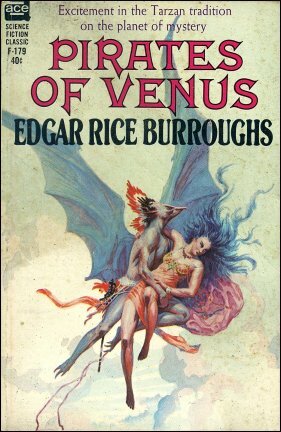 Impossible romances between an equally hardheaded hero and heroine are one of Burroughs’s trademarks, but the one in Pirates of Venus takes the length of a real Venusian day (which is longer than its year) to get in motion. Carson catches glimpses of a beautiful woman while in the gardens city of Kooad, but the Vepajans tell him he cannot meet her or know more about her. But when mention is made of an important woman named Duare aboard a ship, the reader knows that it can’t be anyone other than the mystery woman Carson fell for at first sight. Their meeting is inevitable, as are the complications (she’s the “Virgin daughter of a jong” and therefore sacred), but it happens so late in the story that it might as well have waited to happen in the sequel. Which brings up another problem: the novel has no ending. The last chapter concludes on a cliffhanger, with Carson a captive of the Thorists in the strange country of Noobol. Burroughs used cliffhangers effectively before in his novels, such as in The Gods of Mars. But without a strong storyline behind Pirates of Venus, the non-ending isn’t tense, it’s annoying. Carson finally gets something to motivate him, and the big villains at last show up — and then suddenly it’s all over. I can understand why many readers of Pirates of Venus never went on to the next novel: the story starts to improve, only to give up before it has improved enough to make the reader want to read the sequel. The obvious Thorists-as-Communists allegory might have worked if ERB gave the Thorists anything villainous to do, but it seems like they’re stuck off-stage and keep missing their cue to enter and liven up events with some mustache twirling or red flag-waving. Why create villains as a social critique if they hardly appear at all? In a related gripe, the klangan are a great adversarial race, but they are rapidly tossed aside as directionless thralls. They can’t compete with the Wieroos of The Land That Time Forgot in the “winged villains” department, that’s certain. Craziest Bit of Burroughsian Writing: When Carson thinks he’s held captive in the city of Kooad, he tells a Vepajan that he has the right to life, liberty, and the pursuit of happiness. But he goes on a bit more for the readers’ enlightenment: “I did not think it necessary to mention chambers of commerce dinners, Rotary and Kiwanis luncheons, triumphal parades and ticker tape, keys to cities, press representatives and photographers, nor news reel cameramen, the price that he would undoubtedly have had to pay for life, liberty, and the pursuit of happiness.” Wow, imagine what he would complain about today. Most Triumphantly Stupid Carson Napier Moment: Our hero has the intelligence to build a rocket that can reach another planet, but tries to get to Mars by simply aiming the rocket at the planet without considering that both Earth and Mars are in constant motion. Even five-year-olds know that won’t work. Hell, pre-Copernicus, people knew this wouldn’t work. Best Monster: The tongzan, a hyena-bodied creature with clawed arms extending from its neck and a stalk with a single eye protruding from its head. Most Uncomfortable Moment for the Modern Reader: The mutiny organization that Carson creates on the Thoran ship, “The Soldiers of Liberty,” translates in Amtorian as “KKK.” Hah hah. Associating your heroes in any way with the Ku Klux Klan is not — a — good — idea. Selective Science! Amtorians have developed powerful “R-ray” and “T-ray” guns, achieved medical advances that have effectively eliminated aging… but they haven’t figured out any better form of ship-to-ship communications than hand signals and flags, nor do they understand the curvature of their own planet. Should ERB have continued the series? He kind of had to. He left his hero in the hands of his foes and his heroine declaring her love as she vanished into the sky. A follow-up sounds better than another mediocre Tarzan novel where Lord Clayton gets amnesia and finds a lost city. So, let’s see if we get any more plot the next time out. Ryan Harvey is one of the original bloggers for Black Gate, starting in 2008. He received the Writers of the Future Award for his short story “An Acolyte of Black Spires,” and his stories “The Sorrowless Thief” and “Stand at Dubun-Geb” are available in Black Gate online fiction. A further Ahn-Tarqa adventure, “Farewell to Tyrn”, is currently available as an e-book. Ryan lives in Los Angeles, California. Occasionally, people ask him to talk about Edgar Rice Burroughs or Godzilla in interviews. In Gods of Mars, Carter compares the beautiful black people of Mars with the ugly black people of Earth. A different time, etc, although I suspect even by 1932 some of ERB’s white supremacist views were looking out of touch. Still looking forward with great excitement to the JCOM movie! I have very fond memories of this stories. I was a huge fan of Tarzan and Tarzan comics. In the back of a DC comic called Tarzan Family which the main feature and cover sported Korak on a slave galley. In the back an extra story was an installment from Pirates of Venus. I don’t know for sure who the artist was -not up to digging the comic outta box in my attic- but I know Kubert did some of it. But the imagery of Venus struck a cord with me, and a year or two later I ran across Pirates of Venus in my local libary. And even though I don’t remember a lot of details, I remember it being a grand adventure for a 13 year old boy. I’ve found that Burroughs usually has something in his novels that makes modern readers unfamiliar with pulp attitudes and what popular literature of the time was like stop and say, “what the—?”, so I created that category. Wait until the eugenics stuff goes full throttle in Lost on Venus! Those who are not familiar with the racial thinking of his era often miss many of the subtle differences that show how differently they thought back then. I’m going to make this “different time/different thoughts” theme the feature on the next review, because Lost on Venus contains a massive pro-eugenics screed that shows how much World War II changed attitudes toward “breeding for purity.” It’s both fascinating and disturbing.